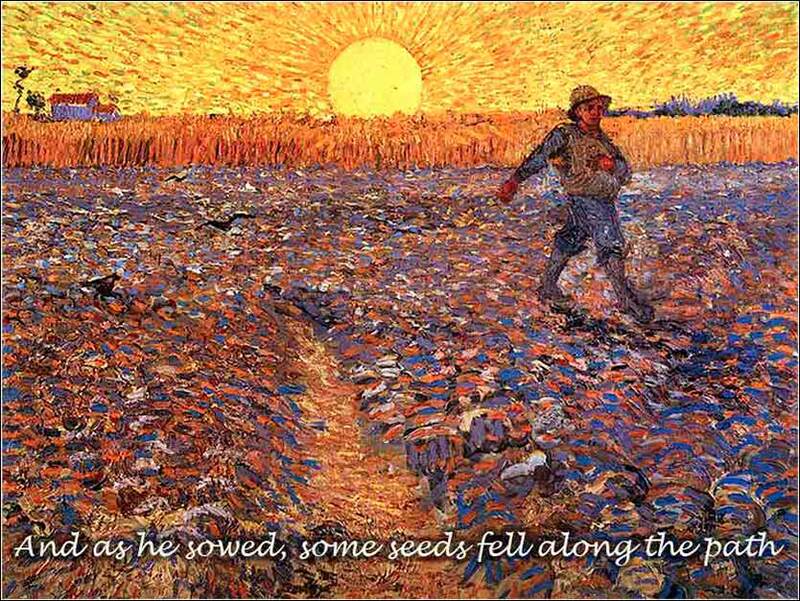 The Sower by Vincent van Gogh, ca. 1888. The Philippine Madrigal Singers give such a sweet rendition of the famous Prayer of St. Francis. Lord, I come before you today in need of your healing hand. In you, all things are possible. Hold my heart within yours, and renew my mind, body, and soul. 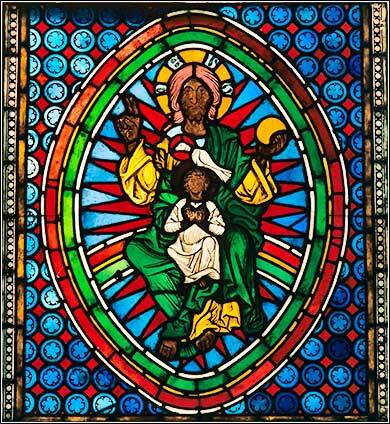 Try to guess where and when this stained glass depiction of the Holy Trinity was made before you read on. . . . What looks like a modern African work is actually an ancient stained glass window created in Hessen, Germany, around 1250 A.D.
Jesus does not explain his parable to the crowd to whom He has told it, but to his disciples in a private talk. But there is no attempt to hide the meaning from anyone interested in hearing it. As He has said in previous verses, those who are open to receiving his message, even if they do not fully understand the parable, will want to hear more; and the disciples, who have already become missionaries going out on their own, will be able to explain it. The first category are what we today would call atheists, although Christ meant to include fairly devout Jews who were trapped in the pride of the Old Covenant: particularly the Pharisees, who were abundant in Galilee. If they even remember a verse from the Bible, it is often with the aim of completely misconstruing it (intentionally or out of ignorance and apathy) and using the misinterpretation to attack Christian teachings. The second group, the seed sown on rocky ground, we would call agnostics. A number of people are able to hear some of God's Word, and even give it some parts of it credence, but it never takes root. They can understand it with their minds, but not their heart. Such people are those for whose souls we can most often struggle successfully. They actually have faith in Christ and have often felt the stirring of the Holy Spirit; but their inner and outer demons pull them away. They might pray in private, but be embarrassed to make any sort of public witness or demonstration of faith. Possibly they cannot let loose of their ties to earthly power, some fleshly desire, or perhaps one of the many variations of pride that the world holds in such high regard; a political stance, or some sort of sexual politics, or wealth, or status in their community. Often, they fear the concept of obedience to God's will, the servanthood of Christ, not able to recognize that they are slaves to sin and their freedom is an illusion. They cannot resolve what they see as a contradiction: that only by the humility of obedience and service can we ever find true freedom. Most of us do little in the way of witnessing or proselytizing in the world; but we must remember, living among the thorns are people who might truly find Christ, if they can find friendly support for long enough to crest the top of the hill, long enough to flip the switch that turns on the light forever. Proverbs 31:10-12 (KJV): Who can find a virtuous woman? for her price is far above rubies. The heart of her husband doth safely trust in her, so that he shall have no need of spoil. She will do him good and not evil all the days of her life.